Photinia integrefolia ssp. Sublanceolata, in Devil’s Kitchen (a.k.a Guna Caves) in the Palani Hills. The picture on the left was taken in 1998 with a panoramic camera on TMX 100 120 format film. The picture on the right, actually a composite image, was taken in June using a digital camera. 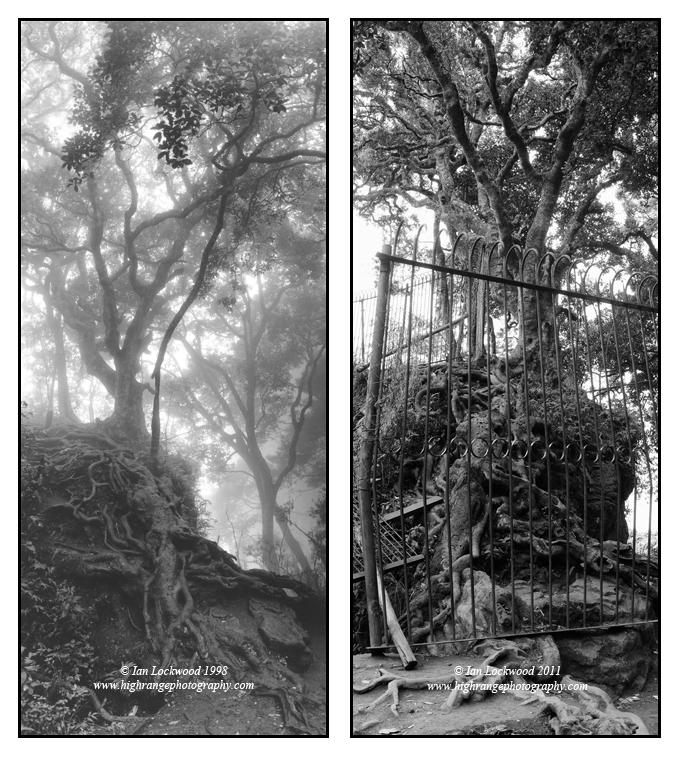 The iron fencing was erected after the spot became a popular destination and was an attempt to keep tourists from venturing near to the edge. For many visitors Palani hills and Kodaikanal have long evoked ideas of deep mysticism and mystery. A place that often conveys these emotions are the cavern’s in Pillar Rocks known as Devil’s Kitchen or more recently Guna Caves. The area is located on the southern escarpment of the Palani Hills where weathered charnockite pillars protrude out of the cliff face. Historically these cliffs were covered in a mix of native grasses and shola (montane evergreen) forest. Because of the unique topography and climatic conditions on the edge of the escarpment the area hosts what was once one of the most unique and finest shola examples near Kodaikanal. When the Palanis were settled by Americans and Europeans fast growing, non-native tree species were introduced to the area changing the views that were sketchedby early visitors such as Douglas Hamilton. The shola at Pillar Rocks, like many in the outer hills, was largely left intact. 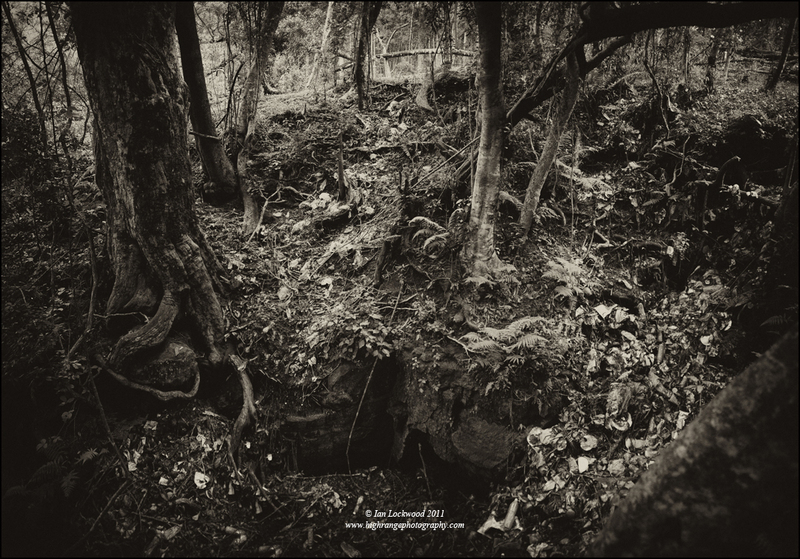 Prior to 1990s the caverns and gnarled shola of Devil’s Kitchen were a favorite, yet little known, hiking spot for Kodai school students and the few hippies and others who resided year around in Kodai. The area was dangerous with numerous caverns enclosed by dense vegetation. In fact there is a memorial at the entrance to the shola remembering an unfortunate trader from Madurai who fell to his death in one of the crevices in the 1950s. A highlight of the trip was to descend into the deepest cave, actually the split between the third pillar and the main cliff face, into the “kitchen.” The hike involved some serious scrambling and a short rope descent before you traversed a dank, pitch-black tunnel and emerged in a forest-enclosed outlet (popularly known as the chimney). In 1992 a Tamil film named Guna was shot within the caverns. In making the film the producers damaged several once-pristine areas but the worst was yet to come. Once the movie was released people wanted to see the site and it quickly became a favorite spot for tourists making the rounds from the Golf Course to Moyer’s Point. The Forest Department now reluctantly manages this flow but the numbers on a busy weekend are astounding. A minor bazaar with shops selling corn, candy and what not marks the entrance to the caves. There is rubbish strewn all over, vegetation has been trampled and areas have been blocked off with massive steel frames and grates. Pesty bonnet macaques (Macaca radiata) scavenge for food while the calls of the Malabar Whistling Thrush (Myophonus horsfieldii) are drowned out by the shouting and hooting of visitors. The Devil’s Kitchen area and its vandalized habitat by chaotic mass tourism underline the challenges of managing sensitive habitats in a hill-station with growing numbers of visitors. For old Kodai residents like me, it is a very personal and sad development that illustrates the worst side of the tourist boom in the hills. Rubbish from tourists dumped into a natural cavity in the shola at Devil’s Kitchen. Main entrance to Devil’s Kitchen with memorial vandalized and turned over by visitors. This was taken on a quiet weekday and is usually filled with large crowds of boisterous tourists. Gnarled roots and branches of the shola edge at Devil’s Kitchen. Vegetation above the deep cavern that is the “kitchen” of Devil’s Kitchen. This area, because of its dangerous chasms is off bounds tourists and still retains the feel of the undisturbed caverns. 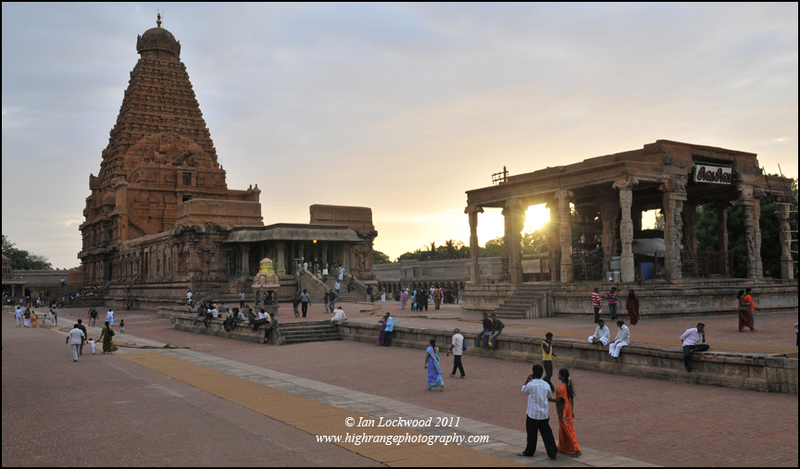 Thanjavur's Brihadishwara temple in evening light, seen from the south-east. 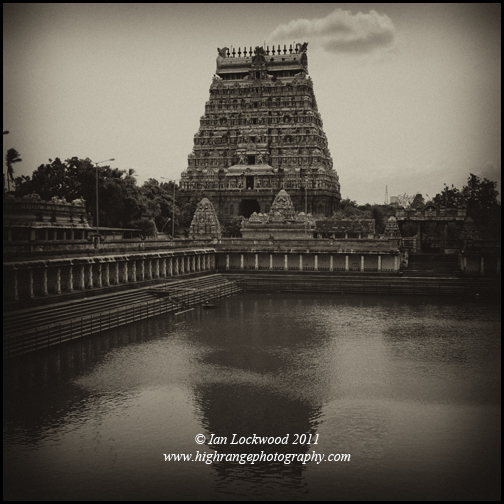 The Brihadishwara temple in Thanjavur represents the pinnacle of Chola architecture and glory. It was built by Rajaraja I (985-1014 CE) at a time when the empire covered most of southern India and Sri Lanka and even included colonies in what is now Indonesia. I was interested to look for linkages with the interaction with Sir Lanka having seen evidence of both the art and wrath of the Cholas in Anuradhapura and Polonnaruwa. 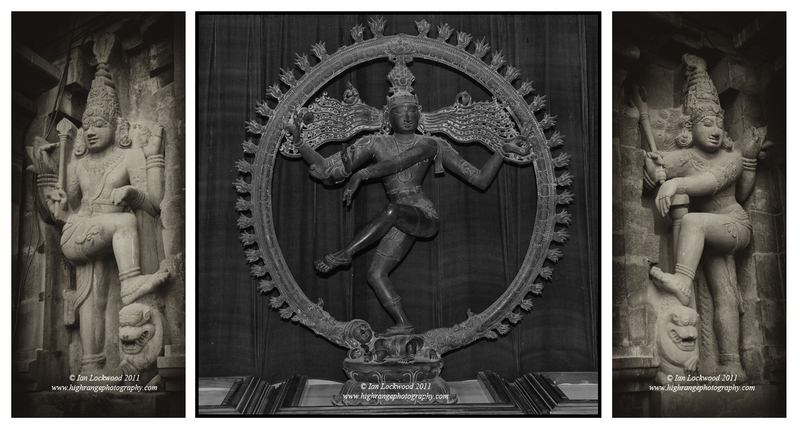 Parvati, consort to Shiva, in the Bronze museum in the Thanjavur Art Gallery as well as the north side entrance of the Brihadishwara temple. Dvarpalas (guardians) at Thanjavur’s awe-inspiring Brihadishwara temple flanking one of the large bronze Natraj statues from the Bronze museum in the Thanjavur Art Gallery. 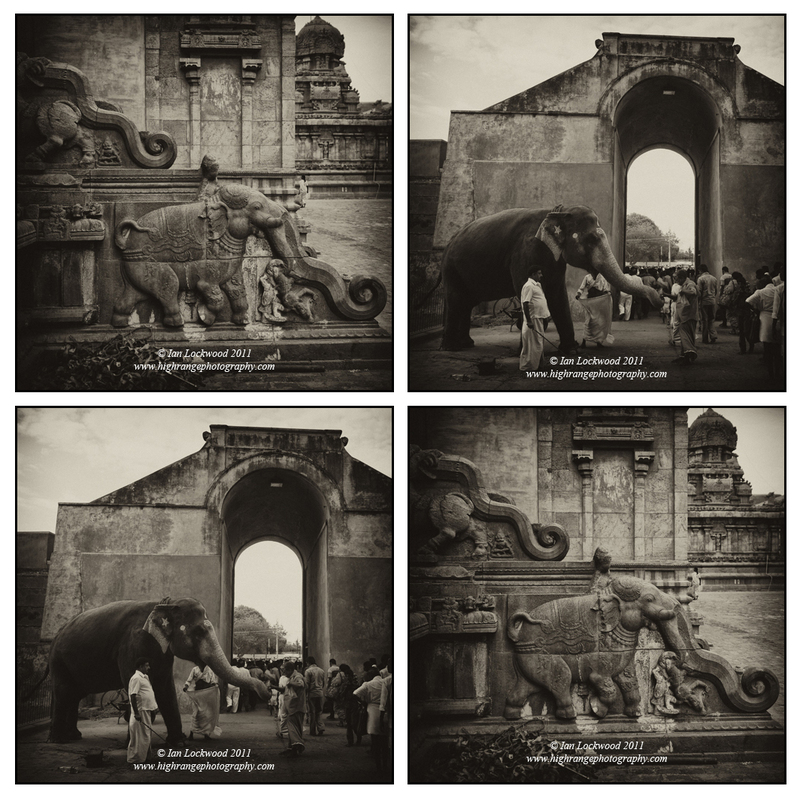 Elephants in life and stone at Thanjavur's Brihadishwara temple. Composite image of Thanjavur's Brihadishwara temple seen from the south-east. 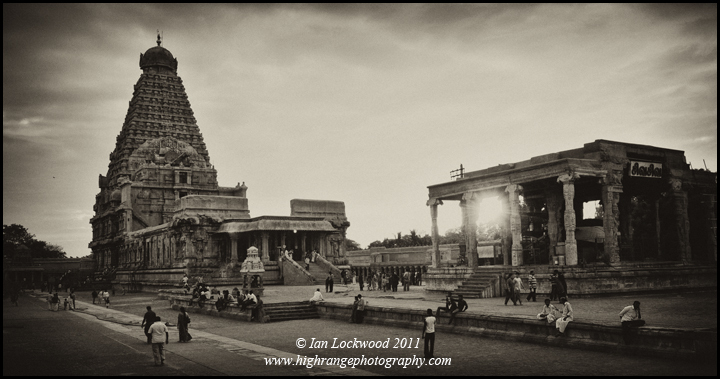 Thanjavur's Brihadishwara temple seen from the south-east (black & white version). “The journey is the destination” and this summer after flying into India from Colombo we moved slowly from Chennai southwards to the hills. Starting in Egmore we took a rented vehicle and were able to visit Mamallapuram, Pondicherry, Chidambaram, Gangkondacholapuram, Tranquebar, Swamimalai and finally Tanjavur before ending up in the cool heights of the Palani Hills. The images in this post were taken during this visit using a digital SLR and then reworked and polished using Adobe Photoshop with plugins from Nik Silver Efex. It marks the first time that I have not shot a major trip on film. Gangaikondacholapuram, South-east corner view with Nandi bull. 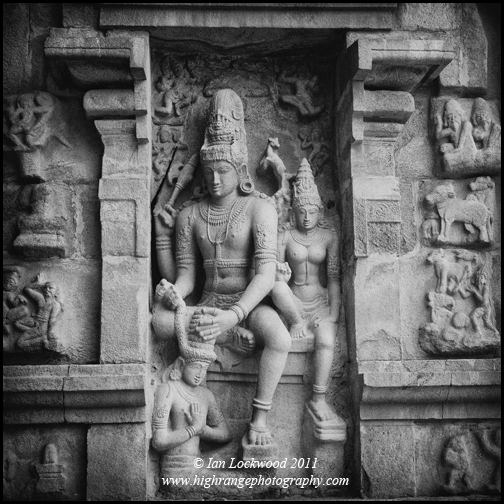 Shiva and Parvati panel on north entrance of Gangaikondacholapuram's central gopuram. Earlier we had made a brief stop at the Croc Bank and Mamallapuram on our way south. The Croc Bank remains one of the best educational opportunities for patents that want to imbibe natural history and a love for reptiles in their children. We look forward to Lenny and Amy attending summer camp here in a few years. Mamallapuram, of course is an old favorite haunt thanks to my uncle Michael’s interest in the Pallavas and their ancient port that was based next to where the shore temple now stands. It is also a great place for kids to explore and climb exquisite rock. Muggers (Crocodylus palustris) basking at the Madras Crocodile Bank. Lenny, & Amy exploring Tiger caves just north of the shore temples at Mamallapuram. 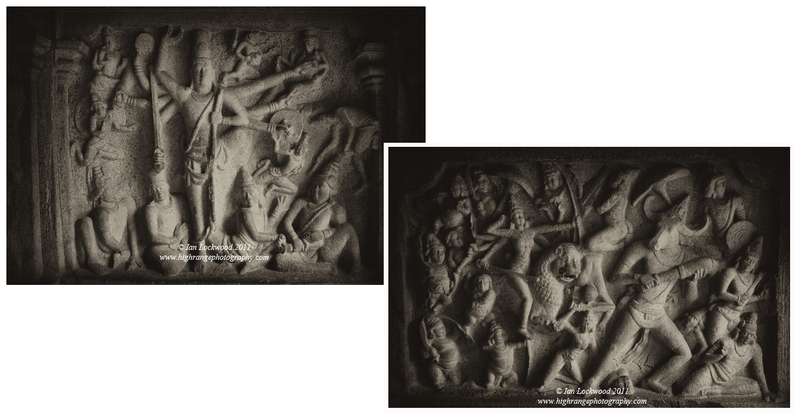 Two panels from Mamallapuram’s caves: (Left) Trivikrama panel depicting Vishnu as a eight armed giant warrior transformed from a dwarf. (Right) Mahishamardini panel showing Durga vanquishing the buffalo demon Mahisha. 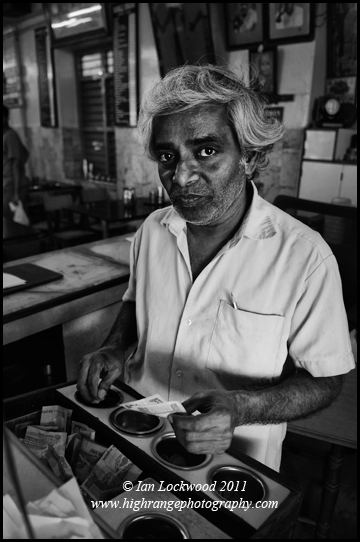 No visit to Mamallapuram is complete without a filter coffee and dosa at Mamalla Bhavan. The manger graciously put up with our kids and my camera. The Great Penance (Descent of the Ganga) panel at Mamallapuram, an outstanding Pallava edifice carved onto a granite face near to the bus stand. Auroville’s Matramandir, seen from the visitor viewpoint that is as close as most people get. It has been nearly 15 or so years since I was last in Auroville. The utopian community and settlement just north of the union territory of Pondicherry (now named Puducherry) was motivated by the teachings of Sri Aurobindo and the Mother. Their pioneering experiments with sustainable living in a south Indian context has long attracted my interest and admiration. I use a video that documents their experiments with afforestation, energy use, biodiversity conservation and low-impact architecture in my IB Environmental Systems and Geography classes. The film is a great resource and always makes me want to take the students to Auroville for a week of work-study. So far that has been impossible but I will continue to build links in the hope of taking students there in the near future. Auroville, of course, has changed a great deal in the years that I have been away. The Matramandir has been completed and there are complex barriers in place to keep the busloads of tourists away from it. Because of this I could not photograph the banyan tree that overlooks it but was able to spend time with several other banyans nearby. The townships on the periphery have grown and the dusty road that leads up to the plateau from the East Coast Road has now been done in concrete. The interiors still evoke the sense of peace with the cycle lanes leading through groves or eucalyptus and native tropical dry-evergreen forest. This time I brought my family and it was gratifying to share the place with them. Lenny under a banyan (Ficus benghalensis) tree near the visitor viewpoint at Auroville’s Matramandir. The community hosts dozens of impressive trees and, of course, the banyans are amongst my favorites. 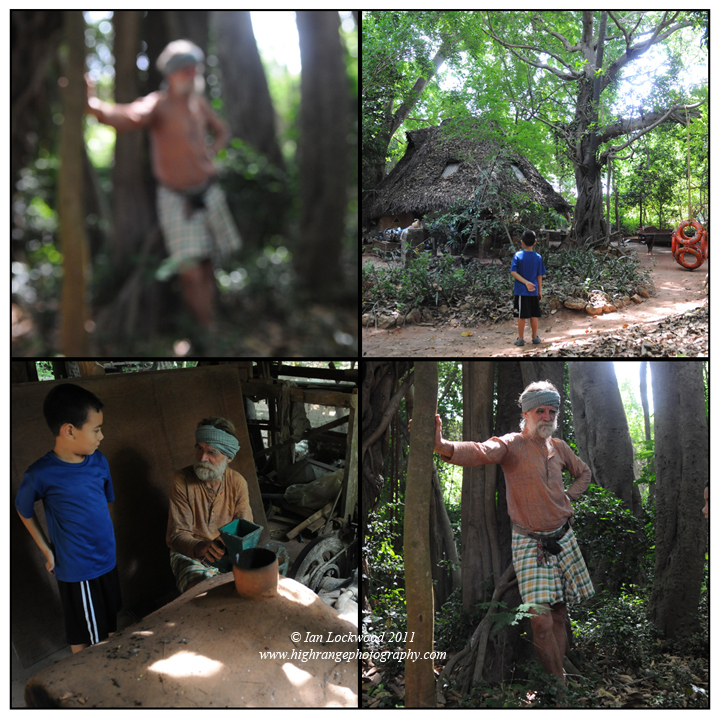 The highlight was taking Lenny to visit Johnny Allen (now Auroville) at his hermitage in Fertile. There are a kaleidoscope of personalities and lifestyles in the community but Johnny lives my idea of the vision. He uses locally available materials for construction, the power comes from the sun and biomass and the impact on the ecology is minimal. He is still using a biomass-fueled Stirling engine to make peanut butter and dosa mix and chutney every Saturday. This was the engine that had first brought my father Merrick here. I had tagged along on several trips in the early 1990s. Johnny’s home is set amongst towering trees, thatched workshops and cowsheds. He is just the sort of teacher that helps you understand the practical side of sustainable living. Lenny was given a personal tour of the Stirling engine, a compost toilet and models of housing units that Johnny is designing for young people. The significance of Johnny’s example may have eluded Lenny this time but he enjoyed playing in the tree houses and variety of swings created from recycled life preservers. 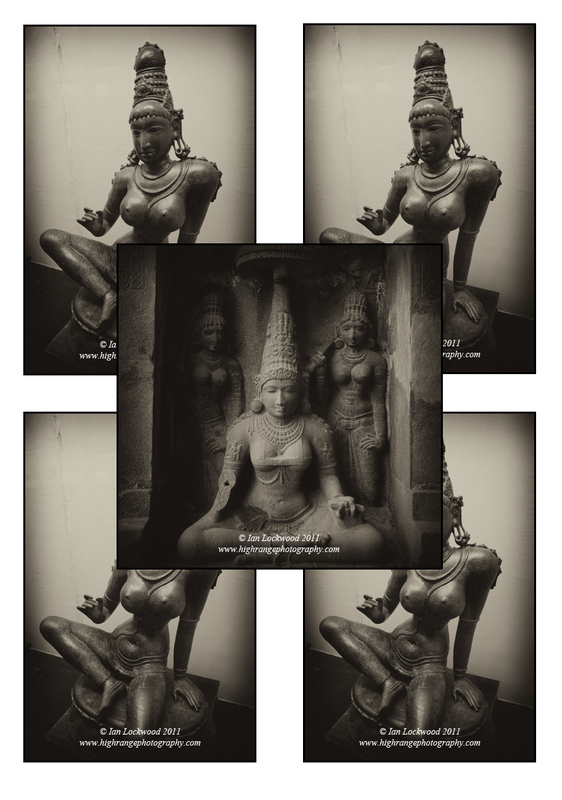 Collage of Lenny interacting with Johnny Auroville…friend, teacher and amazing human being living in Fertile, Auroville.